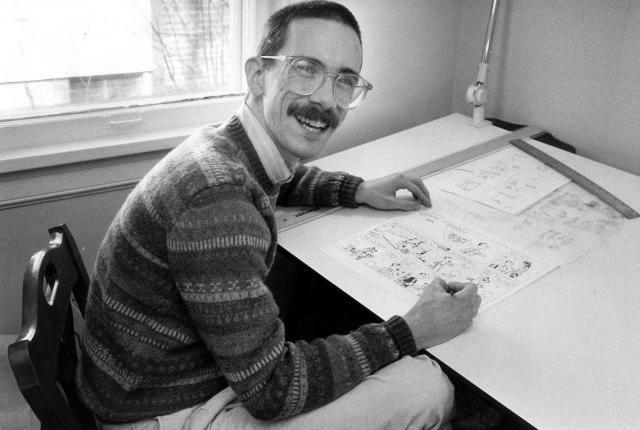 Bill Watterson (geb. 1958 in Washington, D.C.) ist ein amerikanischer Comiczeichner, der hauptsächlich für seinen von 1985 bis 1995 veröffentlichten Comicstrip Calvin und Hobbes bekannt geworden ist. In der Zeit von 1985 bis 1995 erschien Calvin und Hobbes in 2.300 Zeitungen, und es wurden bis dato mehr als 23 Millionen Calvin-and-Hobbes-Bücher verkauft. Entgegen der üblichen Vermarktungspolitik bei Comicstrips wehrte sich Watterson immer gegen die Vermarktung seiner Figuren (z. B. auf Tassen, T-Shirts etc.). Auch die Vermarktung als Fernsehserie wurde durch ihn erfolgreich verhindert. There is a tendency to rehash and regurgitate properties with sequels and remakes. You had an idea, executed it, then moved on. And you ignored the clamor for more. Why is it so hard for readers to let go? Well, coming at a new work requires a certain amount of patience and energy, and there’s always the risk of disappointment. You can’t really blame people for preferring more of what they already know and like. The trade-off, of course, is that predictability is boring. Repetition is the death of magic. Years ago, you hadn’t quite dismissed the notion of animating the strip. Are you a fan of Pixar? Does their competency ever make the idea of animating your creations more palatable? The visual sophistication of Pixar blows me away, but I have zero interest in animating Calvin and Hobbes. If you’ve ever compared a film to a novel it’s based on, you know the novel gets bludgeoned. It’s inevitable, because different media have different strengths and needs, and when you make a movie, the movie’s needs get served. As a comic strip, Calvin and Hobbes works exactly the way I intended it to. There’s no upside for me in adapting it. Your fight over protecting Calvin and Hobbes from licensing deals, and your battle to increase the real estate for your Sunday page comic, were notable—partially because they indicated your incredible autonomy over your work. Had you “lost” those battles, it appears you would have ended the strip. It reminds me of Howard Roark and his desire to blow up his building rather than see it molested by other hands. Was there a critical moment in your career that instilled such unwavering creative integrity? Just to be clear, I did not have incredible autonomy until afterward. I had signed most of my rights away in order to get syndicated, so I had no control over what happened to my own work, and I had no legal position to argue anything. I could not take the strip with me if I quit, or even prevent the syndicate from replacing me, so I was truly scared I was going to lose everything I cared about either way. I made a lot of impassioned arguments for why a work of art should reflect the ideas and beliefs of its creator, but the simple fact was that my contract made that issue irrelevant. It was a grim, sad time. Desperation makes a person do crazy things. Where do you think the comic strip fits in today’s culture? Personally, I like paper and ink better than glowing pixels, but to each his own. Obviously the role of comics is changing very fast. On the one hand, I don’t think comics have ever been more widely accepted or taken as seriously as they are now. On the other hand, the mass media is disintegrating, and audiences are atomizing. I suspect comics will have less widespread cultural impact and make a lot less money. I’m old enough to find all this unsettling, but the world moves on. All the new media will inevitably change the look, function, and maybe even the purpose of comics, but comics are vibrant and versatile, so I think they’ll continue to find relevance one way or another. But they definitely won’t be the same as what I grew up with. I’m assuming you’ve gotten wind of people animating your strip for YouTube? Did you ever mimic cartoonists you admired before finding your own style? Every artist learns through imitation, but I rather doubt the aim of these things is artistic development. I assume they’re either homages or satiric riffs, and are not intended to be taken too seriously as works in their own right. Otherwise I should be talking to a copyright lawyer. Is it possible some new form of sequential art is waiting to be discovered? Could the four-panel template die out as newspapers dwindle? Form follows function, as the architects say. With words and pictures, you can do just about anything. According to your collection introductions, you took up painting after the strip ended. Why don’t you exhibit the work? My first problem is that I don’t paint ambitiously. It’s all catch and release—just tiny fish that aren’t really worth the trouble to clean and cook. But yes, my second problem is that Calvin and Hobbes created a level of attention and expectation that I don’t know how to process. Purely for trivia and posterity’s sake, if you could indulge some (even more) inane queries: One story that’s made the rounds is that a plush toy manufacturer once delivered a box of Hobbes dolls to you unsolicited, which you promptly set ablaze. For people who share your low opinion of merchandising, this is a fairly delightful story. Did it actually happen? Not exactly. It was only my head that burst into flames. I once read a mention of you producing some original art intended for a Rolling Stone cover story that “went south.” Considering your preference for privacy, an invasive profile sounds like anathema. Was this very early on in the strip’s run? Boy, I barely remember this. I think that was the interview that ended up in The Comics Journal. It was early, when my desire to air my grievances with the business temporarily outweighed my desire for privacy. Owing to spite or just a foul mood, have you ever peeled one of those stupid Calvin stickers off of a pickup truck? I figure that, long after the strip is forgotten, those decals are my ticket to immortality. © 2019 Kunstverein Schichtwechsel. Theme by fogsag.